The original Rochesterfest Treasure Hunt began with its first clue on June 20th, 1994, with Bill Davis, who had chaired the Street Dance and was a KROC radio personality, as the first-ever Chair of the event. Each day, Davis supplied clues to Rochester media, assisted by Dave Ferber, who was also a former Treasurer of Rochesterfest. The first “treasure” was a special medallion affixed to a block of marble, and it was hidden in Rochester’s Quarry Hill Park in a hollowed-out piece of wood. Clue No. 1: Though the shape of a medallion I be; I'm stuffed in an old piece of tree; Lying right on the ground; In plain sight I'll be found; And $500 richer you'll be. Pat Hanson and her then-17-year-old daughter, Trea, of Rochester, earned $500 after finding the Rochesterfest medallion on Wednesday, June 23rd, 1994. The following year, 1995, saw Davis being selected as the main Rochesterfest Chair, and handing over Treasure duties to Ferber. 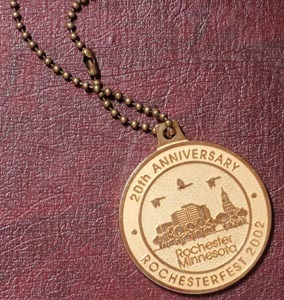 This was the year Rochesterfest celebrated the 30th reunion of the 173rd Airborne Division, and a recent Rochesterfest treasure item was actually a medallion created especially for their return to Rochester in 2002. Ferber’s “family connections” helped him create the second “treasure” item in 1995, an actual paving stone from an old and modernized section of Center Street. Robert Bale, Ferber’s uncle, worked for the City of Rochester, and had access to these small pieces of Rochester history. Ferber had the “brick” engraved with information for the finder, and it was used for several years before being retired. In subsequent years, this brick was used in a ceremonial “passing of the brick” from the past-Chair to the incoming Chair of the Festival. The Shubert family found 1997’s brick Monday night in Parkwood Hills Park, north of Quarry Hill, behind the right field fence post on the edge of a wooded area, another quick find. The contest was sponsored that year by the Rochester Post-Bulletin. The 1998 Rochesterfest treasure hunt went longer, and was found Thursday June 25th, 1998, under a pine tree near Silver Lake, across from the power plant. It was found by 14-year-old Thomas Bofferding, who won $500 for his efforts. This year, the brick wasn’t used and Ferber began creating treasure items “from Rochester’s history.” The clues then became more difficult, pointing to both “where” it was, and “what” it was, potentially causing people to work harder to decipher them. Noting the importance of computer-maker IBM to Rochester’s history, a computer diskette became 1998’s “treasure” item. In 1999, the “item” hidden was a bookmark featuring St. Francis of Assisi, an obvious nod to the order that helped start St. Marys hospital. This treasure was hidden on the bike path just north of Pinewood Elementary School, next to the Jean & Carl Frank Canine Park in southeast Rochester. The 2000 Rochesterfest treasure was found, on the first night of the event, by Thomas Hendricks of Rochester. That year’s treasure was hidden under a pine tree in back of Gage Elementary School. According to Hendricks, his son was playing under the tree and found the treasure by accident. Hendricks had heard the clues, but wasn't actively searching for it. The treasure was a small plastic toy ox, which relates to the story of George Head and the paving of an early Rochester street by pulling a log behind an ox. 2001 marked the year that the Hunt was turned over to chairs by Dave and Pat Pennington. The $500 prize was sponsored by Majestic Pines Casino, and was awarded to five finders. This treasure was found in Rochester’s Soldiers Field Park. Ferber returned as sole Treasure Hunt Chair in 2002, and the treasure was hidden in the little park at 6th Street SW and Broadway, across from Rochester’s Fire Station #1. The item was a Sears brand pocket watch, which connected to Richard Sears, who was born just south of Rochester and who started out his career by selling watches. Sears became the founder of Sears stores. This was a somber year, as we mourned the loss of Aly Hazama, wife of former Mayor Chuck Hazama. A dedication in this park was made in Aly’s memory during Rochesterfest. 2003’s treasure was hidden at the new Riverside Elementary School, and was a laminated business card from 50-year-old KTTC Television, a 50-year resident of the city. 2004’s item was a Rochester Sesquicentennial medallion, hidden on the trail just west of the Rochester Recreational Center on North Broadway. The trail intersects with Elton Hills Drive, and the medallion was behind the first layer of riprap rock just north of that bridge. This hunt went until Friday morning, the longest that the treasure has been “unfound” in its history. 2005 was another short year, when Theresa Hubert of Rochester found it on Tuesday that year, in Slatterly Park in southeast Rochester, near a tree in the outfield of the baseball diamond. The 2006 Rochesterfest treasure was found, on Wednesday morning of that week, by two Rochester women, Patty Walk and Helen Hodge. The treasure item was a replica of a 1983 Rochesterfest button, and found behind Willow Creek Middle School near the track and field area. The button, as a historical item, was significant because 1983 was the first year buttons were sold in support of the event. 2007’s treasure was found on Tuesday, by Denise Smith of Rochester, with help from family and, especially, her 10-month-old grandson Carter. The treasure was hidden in the small park just north of Essex Park, and the treasure item was a toy replica of a 2004 Dodge Magnum vehicle, a nod to sponsor Adamson Motors. The Treasure Hunt was also sponsored by Trade Mart Furniture Center that year. Smith saw the toy car, and thought she would pick it up for her grandson to quiet his fussing. As she pulled it from the shrubs, it was evident that it was the treasure. She split the money evenly with her daughter and son-in-law, who were with her when she found it. 2007 was the first year that the Bonus Clue was introduced to spice up the search! In 2008, treasure hunters took until Thursday to find the hidden item, which is the third item, a Treasure medallion. The treasure was found by Dan Sucher of Rochester. Dan deciphered all of the week’s clues, and with his wife, he found the medallion in Rochester’s White Oak park, on 55th Street NW, in an open space underneath one of the parking blocks in the lot. The 2009 treasure was found, on Thursday morning after the 4th clue was released, by Josiah Nagel and his father Todd. The medallion was hidden on the north side of Century High School, between numbered doors 9 and 10, in the gravel landscape treatment next to the building. Dozens of people searched the grounds that morning, having successfully deciphered all clues. 2010 saw a year where the treasure was found early, on day number one, by Susan Warndahl of Rochester. Susan said she knew that historical treasures were hidden at newly built schools, and so George W. Gibbs, Jr., Elementary School seemed a good place to look. Susan and her family had searched for years, with 2010 being the year for them! The treasure was hidden on the south side of the school, near the entrance. The 2011 Treasure was found on Wednesday, the third day, when Lance Vrieze searched just south of the 4th Street SE bridge, just east of the Riverside building and on the west side walking path. The medallion was neatly tucked underneath the base of the 5th light pole from the street, and was discovered just after lunchtime, on a drizzly afternoon. In 2012, Rochesterfest's 30th year, the Treasure was found in southeast Rochester along the buildings near Campus Drive SE, just south of the Olmsted County waste-to-energy facility. Anastasia Woodruff, of Rochester, searched and discovered the hiding place after three clues, on Tuesday. It took three days to find the 2013 Rochesterfest Treasure and Angie Balloy of Rochester zeroed in after four clues. The Treasure was found at Frank B. Kellogg Middle School in NE Rochester, neatly tucked under the main sign in front of the school. The lucky 2014 finders were Jeff and Hiedi Treitline of Rochester, who discovered the Treasure in Glendale Hills Park on Northern Valley Drive NE, under the rocks piled near the park sign. Clues were supplied for two days. In 2015 the Treasure was found hidden behind a tree just off the path around Cascade Lake in northwest Rochester. Three days of clues and two BONUS clues were all that was necessary to bring Josh, Joey and Jake to the 2015 Treasure location. It was the "sandbox of men" that took this trio to Cascade Lake Park and its two-plus miles of trail. The Treasure was tucked into the back of the protective mesh wrapped around the base of the dozens of trees surrounding the Cascade Lake area. One special tree held the Treasure, which itself was wrapped in a black sleeve. It was found Monday afternoon. In 2016, Jonathan Schmidt of Rochester successfully deciphered all six daily clues AND three bonus clues supplied to sponsors Trade Mart Furniture Center, Whistle Binkies Pubs and ABC 6 News, and found the Treasure medallion at the top of the hill in Indian Heights Park in northwest Rochester at approximately 8:00 a.m. on Thursday. “I thought it might be the bottom of a bottle,” said Schmidt as he moved two small logs away from a tree stump that had a cavity partially filled with water from recent rain and which contained the clear lucite medallion. Schmidt said there were about two dozen other Treasure seekers in the vicinity, but that he quietly left the park with his prize. The daily clues led Schmidt and many other hunters to several City of Rochester parks including Quarry Hill, Silver Lake and Goose Egg Park. 2016’s Thursday morning find capped a six-day search for the Treasure which has been a part of Rochesterfest since 1994. 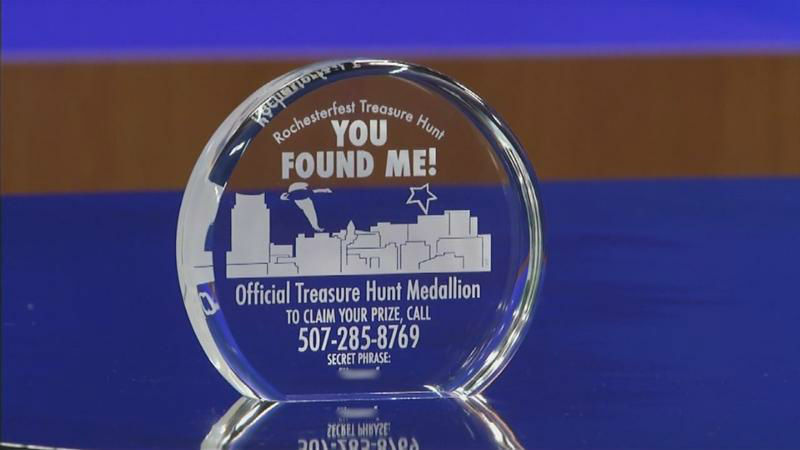 2017's Treasure Hunt was a marathon, with hundreds of Treasure seekers scouring every inch of Rochester's public parks and schools. The 2017 Treasure was found Thursday morning at Southern Woods Park, at 11th Avenue and 48th Street SW, just off the walking path near the playground equipment. Four people were involved with the discovery; Tom and Max Gort, Ben and Georgiann Steely. Hiller's Flooring America signed on as our newest Treasure Hunt to sponsor the 2018 Treasure Hunt, and after four regular clues plus two BONUS clues, it was found. Matthew Vetting and his son took the Tuesday clue and interpreted correctly to lead them to Allendale Park in northwest Rochester. "My son and I found the medallion at 7:45 this morning in Allendale Park under a bush after searching the park for 10 to 15 minutes. We were led to this park by searching coat of arms and the names of Rochester parks in the northeast quadrant of Rochester. The Allendale coat of arms is a lion and eight crescent moons. Looked under bush which has four letters. Allendale is a compound of two names Allen and Dale." Where will it be found next? Stay tuned! Copyright © 2019 Rochesterfest. All Rights Reserved.